I frequently hear people say it is so much more convenient and affordable to just rent a boat when they need it as compared to keeping a boat all year around. Owning a boat is not only costly but also a huge commitment. With temperatures hovering over 30 degrees C (100 degrees F) and so hot outside here around the Okanagan Lake, it is also really tempting to cool down in the water. Being on one of our boats makes that a lot easier and more enjoyable. If you are more of a sporting type of person, there are a lot of activities that can be done in the water such as tubing, wake boarding, skiing or surfing. When I get my visitors on the water, we have to make decisions about what where we want to go and what we want to do. Boating to Peachland for lunch or dinner depending what time of day it is, usually is one of my top 3 suggestions. 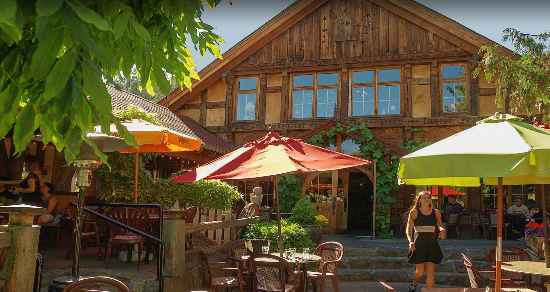 I also have to add that the Gasthouse is one of my favorite places to go eat – it is usually always full there so the best thing to do is to call ahead and get a table outside to really get the full enjoyment of the peachland atmosphere. 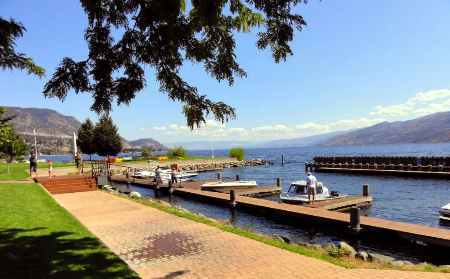 I find Peachland to be a super charming town with small stores, cafes and restaurants. 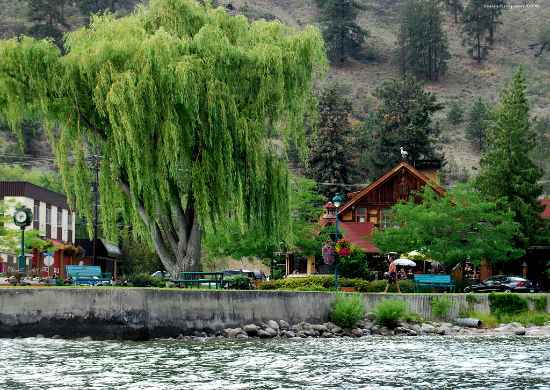 Whether we either do water sports on the boat trip down to Peachland or just go for a scenic boat ride, it is the perfect place to stop for a lunch break. There is free tourist/visitors boat parking right downtown and I have never had any problem finding a spot to park the boat. In this map, I have also marked a place called Rattle Snake Island. 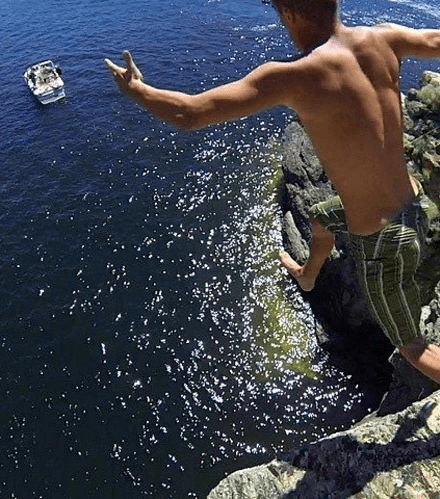 The reason for is because it is not just a beautiful, historic and scenic place to see from the water but also a place where people go to jump from the cliffs. The best cliffs near Rattle Snake Island is Squally Point and the picture below is one of our friends jumping while we our in the Kelowna boat rental below watching. There is no place for you to park the boat so someone would have to stay in the boat all times, maybe to shoot the pictures, and to cheer the jumpers on.